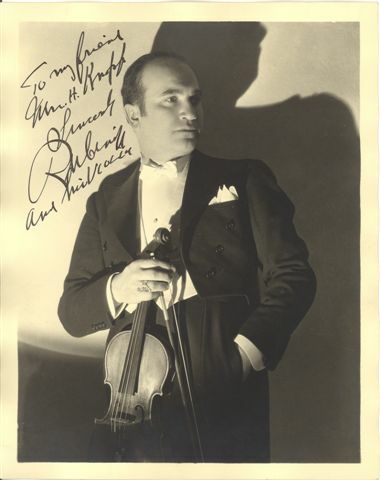 David Rubinoff contributed his "magic violin" on a few of Nick Lucas' Brunswick recordings in the mid-1920s. Born in Russia, September 13, 1897 David Rubinoff started playing the violin at the tender age of five and performed with the Russian Army Band. As a child with exceptional talents he was just 14 years old when he graduated from the Royal Conservatory of Music in Warsaw. Composer Victor Herbert espied young Rubinoff's talent and shipped him and his family to the United States. With the help of Rudy Vallee he got into radio and then the movies. The violinist entertained troops during the wars and performed for Presidents. In the 1930s he was a regular on the Chase and Sanborn Radio Hour. He was also an orchestra conductor and appeared on shows with Eddie Cantor and Jimmy Durante. David Rubinoff died October 6, 1986. Copyright 2004 - 2013 Melody Man Records. All Rights Reserved.